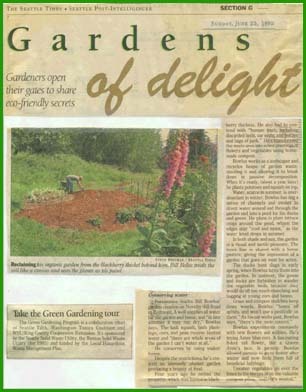 Excerpt from: "Gardens of Delight"
This portion of the article describes Bill's garden. Gardeners open their gates to share eco-friendly secrets. Picture caption:Reclaiming his organic garden from the blackberry thicket behind him, Bill Bowlus treats the soil like a canvas and uses the plants as his paint. Persistence marks Bill Bowlus' garden creation on Novelty Hill Road in Redmond. A well supplies all water for the garden and home and "in late summer it may run dry," Bowlus says. The lush squash, herb plantings, corn, and peas receive limited water and "there are whole areas of the garden I can't water at all." He conserves by using soaker hoses. Despite the restrictions, he's created an intensely planted garden producing a bounty of food. Four years ago he rented the property, which was buried in blackberry thickets. He also had to contend with "human trash, including discarded beds, car seats, and bottles and bags of junk." He's transformed the waste area into island plantings of flowers and vegetables using homemade compost. Bowlus works as a landscaper and recycles heaps of garden waste, stacking it and allowing it to break down in passive decomposition. When it's ready, (about a year later) he plants potatoes and squash on top. Water, scarce in summer, is overabundant in winter. Bowlus has dug a series of channels and swales to divert water around and through the garden and into a pond for his ducks and geese. He plans to plant lettuce crops around the pond, where edges stay "cool and moist," as the water level drops in summer. In both shade and sun, the garden is a visual and tactile pleasure. The fence line is shared with a horse pasture, giving the impression of a garden that goes on west for acres. The ducks hunt slugs in early spring, when Bowlus turns them into the garden. In summer, the geese and ducks are forbidden to wander the vegetable beds, because they would do all too much munching and tugging at young corn and beans. Grass and compost mulches keep down weeds. Bowlus "hoses of aphids, and won't use a pesticide on them." As his cat walks past, Bowlus says, "there's the mole control." Bowlus experiments constantly with new flowers and edibles. He's trying Aztec blue corn. A fascinating 8-foot tall flower, like a Queen Anne's lace, is parsnip. Bowlus allowed parsnip to go to flower after winter and finds them full of beneficial ladybugs. Uneaten vegetables go over the fence to the horses or on the valuable compost piles; "nothing's wasted." "Take the Green Gardening Tour"
The Seattle Green Gardening Program is a collaborative effort of Seattle Tilth, Washington Toxics Coalition and WSU/King County Cooperative Extension. It's sponsored by the Seattle Solid Waste Utility, the Renton Solid Waste Utility (for 1995) and funded by the Local Hazardous Waste Management Plan. All Contents © Copyright 2005-2013 Living Earth.